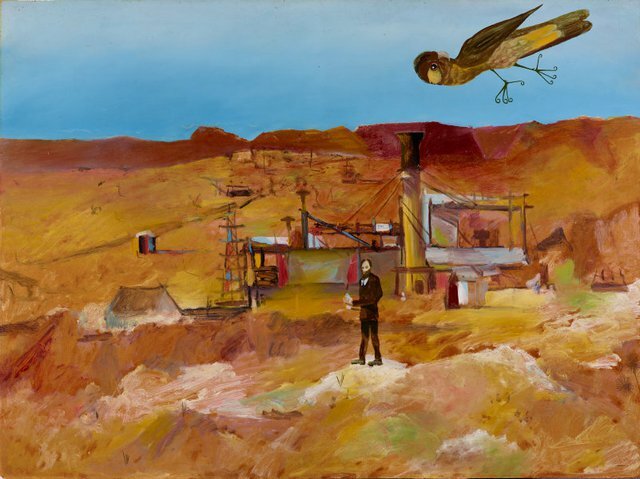 One of a series of 'Outback' paintings made following a trip to Queensland and Fraser Island in 1947, 'Pretty Polly Mine' - with its haunting, desolate remains of a once prosperous past - was the first of Nolan's works to be acquired by any public gallery, together with 'Carron Plains'. Nolan's concept of the Australian landscape is interwoven with its history, legends and the psyche of its inhabitants, producing works which are often surreal in character. Signed and dated l.r. corner, pencil "4-12-48 / 21 Nolan".